Hello everybody, there is a library gson-2.2.4.jar included in Ivy. We need to use newer version because of some functions. 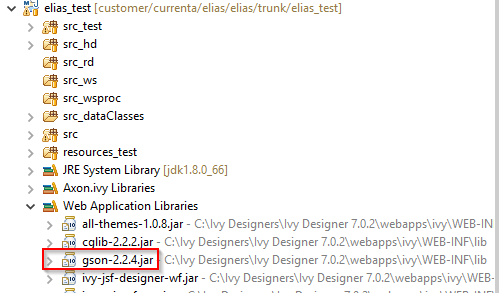 we try to use external .jar like in other cases, but in this case the library included in ivy is always used. How can we simply priorise (override) own library version ? You should be able to just replace the existing library in /webapps/ivy/WEB-INF/lib with your newer replacement. Just keep care that you also do it in productive Engine environment and not only in the Designer.